Cities Connection Project | YVOY. GENEVA. 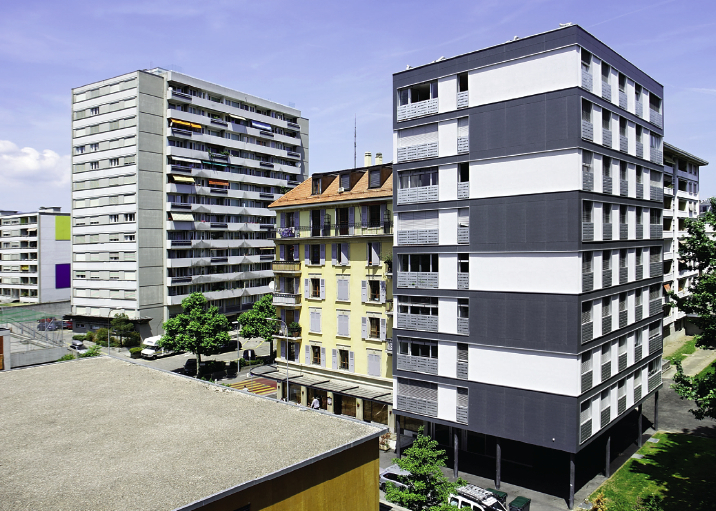 Located in a Geneva’s district called “Jonction”, this building of 16 apartments was built on behalf of the Private Foundation HLM. This house fills a remaining space in a location characterized by the presence of a large unit of buildings realized by the Honegger Brothers in the 1960s, between Boulevard Carl-Vogt and Boulevard d’Yvoy. The hight of the construction is aligned on this unit, 8 storeys on the ground floor, opening up a volumetric dialogue between this group of buildings. Previously occupied by an open air car park, the back yard and the walkways were redefined. The building includes a staircase with natural daylight anddispatches2apartmentsperfloor(3roomsand5 rooms). Perforated metal elements noticeable on this project are a nod to the work of American artist John Maeda. Atelier d’Architecture 3BM3 carried all Sia’s phases in the construction of this building. “…There are in all cities some places without any particular appeal. Places hollow, indented, scattered throughout the useful frame of the urban fabric … They are not born of a particular desire but precisely of a lack of will … One discovers them by chance, going astray and getting mistaken … One knows when he hits one of those pockets of silence, one of those “non-places” where the imperious city – the one that is, is exposed, vibrates – withdrew … The building seems to float slightly on pillars made visible by the reduction of its base … Walking away, I think to myself that I too would be happy to live here”.